Sean Cunningham's first post-Friday The 13th film was shrugged off by most critics but it is better than its reputation might lead one to believe. The narrative's twists and turns aren't too difficult to predict but the lead characterizations and the colorful supporting characters keep the story interesting. Better yet, the cast is really top-flight: Kate Mulgrew is a classy and resourceful heroine, the same can be said for Shawn Von Schreiber (very poised in a challenging role for a child) and Rip Torn brings his full intensity to the role of the film's sleazoid villain. 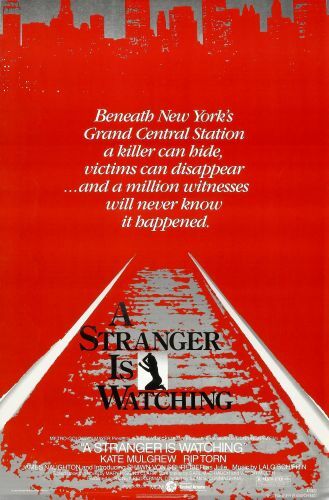 Sean Cunningham's direction is functional but effective: he's not quite a stylist but he gets solid performances all around, makes nice use of the atmospheric train station setting and hits the story's suspenseful beats with the right amount of punch. The end result is essentially the R-rated version of a made-for-t.v. movie but the craftsmanship is solid enough to make A Stranger Is Watching worth a look.